Dame Laura Davies' admission to the World Golf Hall of Fame is entirely justified but it is impossible to fathom why another great British name continues to be ignored. What does Ian Woosnam have to do to gain recognition from the Florida-based organisation? The Welshman was not on the list announced for the 'Class of 2015' inductees and it seems his name wasn't even considered. At a meeting in Augusta last week the committee chose Davies, Mark O'Meara, David Graham and the legendary architect AW Tillinghast for Hall of Fame status. They were picking from a shortlist that didn't include Woosnam's name. This is despite the diminutive Welshman being a former world number one from a fine era in the game's history. Woosnam has only the one major title - the 1991 Masters - but is among golf's most prolific winners. In his pomp he was beating the likes of Seve Ballesteros, Greg Norman, Sir Nick Faldo and Sandy Lyle. Quite rightly all of that illustrious quartet are in the Hall of Fame, as is Colin Montgomerie, who has no majors but eight European Tour Orders of Merit. 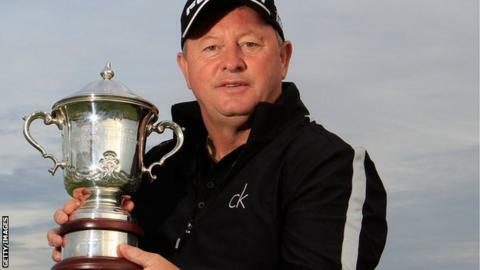 Woosnam won the Dutch Seniors Open earlier this month. It took the 56-year-old's tally of career victories to a handsome 51. A genuinely global player, he's triumphed from Augusta to Australia, from Singapore to Scandinavia and many points in between. He is also a winning Ryder Cup captain after his European team won by a record-equalling 18½ to 9½ points in 2006. Woosnam must be genuinely puzzled that he has been overlooked yet again. Graham won 38 professional titles and O'Meara has 34 to his name. Yes, each won two majors but in terms of longevity and impact on the game Woosnam beats both of them. The image of his celebratory fist pump after holing the winning putt at the Masters endures to this day. It was emblematic of a glorious period for European golf and was one of the most popular wins in the tournament's history. "Woosie", as he's universally known, has often had the knack of making headlines. Who could forget his despair at discovering the extra driver in his bag at the 2001 Open at Lytham? His caddie's error cost him a two-stroke penalty as he led the championship at the start of the final day. Somehow he remained composed enough to finish tied third behind David Duval. And the current oversight isn't just a case of Woosnam being denied due recognition for his superb career. There are golfing implications as well. Hall of Fame membership provides entitlement to play the American Champions Tour. The Oswestry-born Welshman remains a fine player, as his recent Dutch win shows. If eligible Hall of Famers enjoy unbridled access to the lucrative US circuit, it is wrong that he has been denied a straight pass to the highest level of seniors golf. His playing achievements should have long since been enough to allow him to avoid attending seniors' tour school. Aside from Woosnam's Masters victory he was runner up at the 1989 US Open and twice came third in the Open. Indeed, the fact that such a career has so far been ignored by the Hall of Fame provides reason to call into question the validity of this automatic exemption for the Champions Tour. These commemorative organisations shouldn't be a source of playing rights. Their role is to promote and preserve the history of the game. And, in this regard, it's not all about results and achievements. Montgomerie is a perfect example; he didn't win a major but has left an indelible mark on the game. A hundred years from now, students of golf will want to know about the Scot, one of the most famous figures of this era. It is, after all, a hall of "Fame". The same applies when they consider the impact of Laura Davies or the 265 courses designed by Tillinghast. Those historians should also be pointed in the direction of a little Welshman who's supreme ball-striking overcame a debilitating back condition to conquer the world in the 1980s and '90s. Woosnam is one of the game's great competitors, a man of charisma and achievement. It is more than an injustice if he continues to be overlooked.